Paro Airport is situated in a deep valley on the banks of the river, Paro, at an elevation of 7300 feet. The airport is flanked by high peaks on all sides, making it one of the most challenging airports in the world. Only eight pilots around the world have been certified to land at this airport, as it requires accurate judgment and unique flying skills. 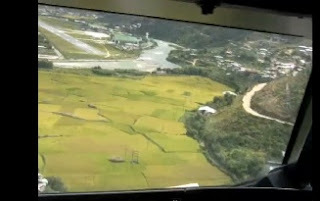 The airplanes at Paro are allowed to land only during the daytime, as it is dangerous to negotiate the Himalayan mountains and icy peaks during nighttime.